University of Colorado Nordic skier Arnaud Du Pasquier heads for the finish in a dead sprint in Sunday's Steamboat Marathon 10K. Du Pasquier won handily. View full marathon, half-marathon and 10K results here. 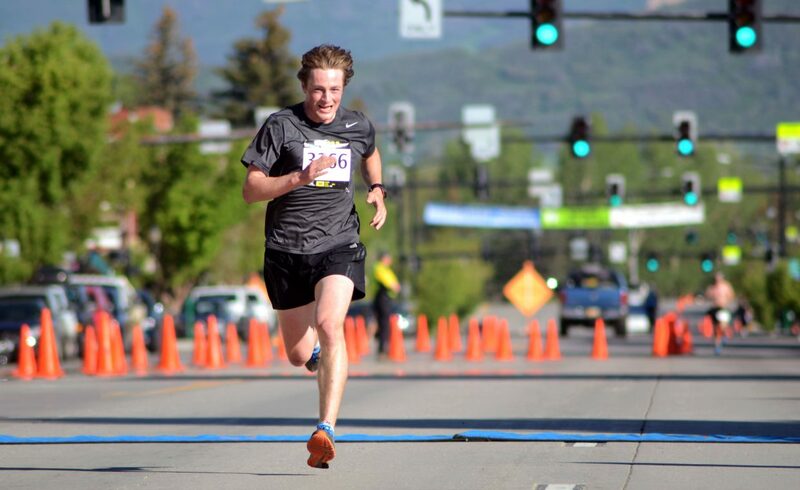 Steamboat Springs — Arnaud Du Pasquier had roughly 100 yards of Lincoln Avenue pavement to go when his eyes lit up, an ear-to-ear grin erupted and he decided to kick it into a dead sprint. The idea of winning was foreign to the, well, foreigner from Switzerland. He’ll be the first to admit, he doesn’t exactly fit the mold of your traditional distance runner. Bearing a somewhat stocky 170-pound frame with muscular legs, Du Pasquier makes most of his noise on the Nordic ski trail as a member of the University of Colorado ski team. This whole distance running thing may not be a bad side gig, though, Du Pasquier said after crossing in 37 minutes, 6 seconds to win the Steamboat Marathon 10K on Sunday morning. And what a finish it was, perhaps in the most fitting fashion given Steamboat’s Ski Town USA moniker. That’s where Pasquier insists that despite his unnatural running style, the Steamboat Marathon 10K suited him well. The course started with a dramatic climb roughly 1 mile long, weaving through Old Town Steamboat, past the high school and along Amethyst Drive toward Steamboat Springs Middle School and Strawberry Park Elementary. Just beyond Routt County Road 38, runners turned around and headed back toward downtown and the Lincoln Avenue finish, with plenty of steep climbs in between. Even runners in contention with Du Pasquier were sure the Swiss-native skier — and now runner — was going to slip, given his attack on the course’s toughest stretches. “I kept watching him thinking, ‘He’s going to slip. He’s going to slip,’” second-place finisher Justin Liddle said. Du Pasquier ended up with a wide margin down the final sloped portion, cruising to a 46-second win beyond Liddle. Colorado Springs’ Brad Poppele was third in 38:48, and Steamboat’s Evan Weinman — also an accomplished Nordic skier with the Steamboat Springs Winter Sports Club — was the top local finisher in fourth, crossing in 39:10. On the women’s side, Ruth Waller easily coasted to 10K gold. Waller finished in 40:33, and second-place Eliska Hajkova recorded a time of 43:42. Cecilia Pascual Garrido, of Broomfield, was third in 44:43, and Steamboat’s Morgan Briggs was the top women’s local finisher in 46:30 for fourth place. Sam Long looks every bit the part of a distance runner. His long, ropy legs stride with ease, and his slight frame looks barely able to keep his running tank top from sliding off his lean shoulders. Long is just as youthful as he is poised with his running. He’s 18 and is less than a week removed from receiving his Boulder High School diploma. He was also Sunday’s Steamboat Marathon 13.1-mile champion. Like the 10K, the hilly half-marathon course gave Long and company trouble, but the slender teenager was able to use it to his advantage, holding steady to his strategy, running down those who tore out too quickly and pulling away to win by more than two minutes. Long (1:15:30) edged out second-place Billy Edwards, also of Boulder, who crossed in 1:17:57. Former Steamboat runner and now Denver resident Luke Crespin said the late-morning heat got to him a bit, causing some hamstring cramping. Still, Crespin took third place in 1:19:46. Steamboat’s Josh Smullin was fourth in 1:23:06. Boulder’s Bean Wrenn — fresh off running in the Vancouver Marathon — won the women’s half-marathon by a large margin, crossing in 1:24:58. Second-place Kari-Anne Samuelson, of Denver, was second in 1:27:40. Steamboat’s Heather Gollnick was third in 1:34:27.